Make my Chopped Asparagus Salad recipe when the spring asparagus is plentiful and cheap, and you’re craving a bit of fresh crunch in your life after a long winter. This cold asparagus salad becomes a complete meal with a few well chosen add ins like tuna and hard cooked egg, or turn it into an asparagus pasta salad ~ it’s up to you! OMG asparagus is in season, and the grocery store has it stacked to the ceiling! It’s so cheap, too, how can you not bring home multiple bundles of the stuff?? I say grab it and work out the details later. 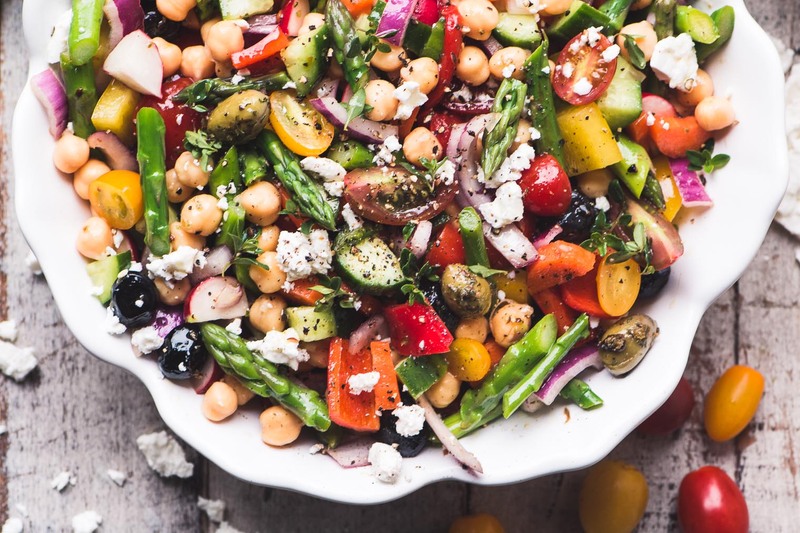 The other day I made my ASPARAGUS SALAD WITH MIMOSA VINAIGRETTE, and today it stars in this chunky Mediterranean inspired salad ~ I’ll add whatever I’ve got in the pantry and in the fridge at the moment. It’s a favorite around here. 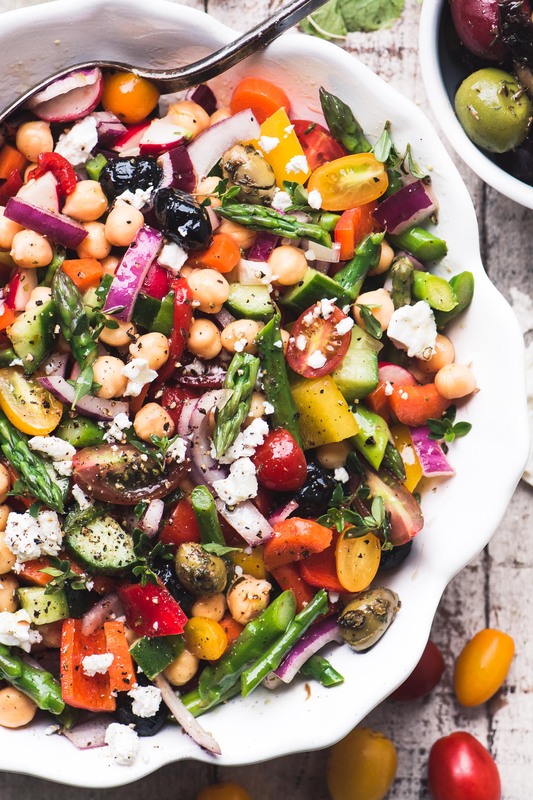 In this case I’ve featured asparagus and other spring veggies like radishes, baby peppers, and carrots, but the recipe follows in the footsteps of my other chunky salad faves, like MEDITERRANEAN BEAN SALAD and COWBOY CAVIAR. 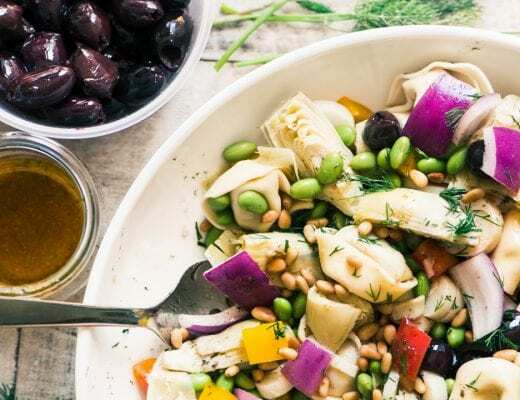 The through-line being a colorful mix of beans and veggies with a punchy vinaigrette. 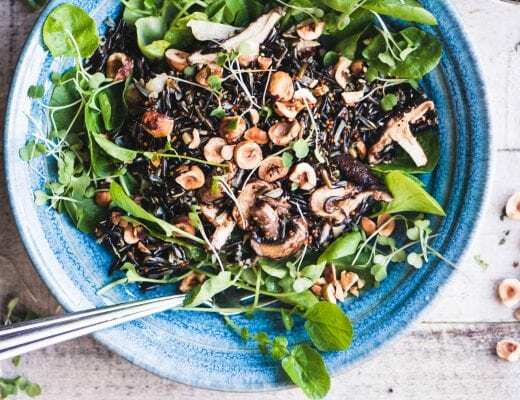 This recipe celebrates the changing season ~ it’s light, fresh, crunchy, and begs to be eaten outdoors, so dish yourself up a plate, and sit out in the backyard or on the deck and drink it all in! 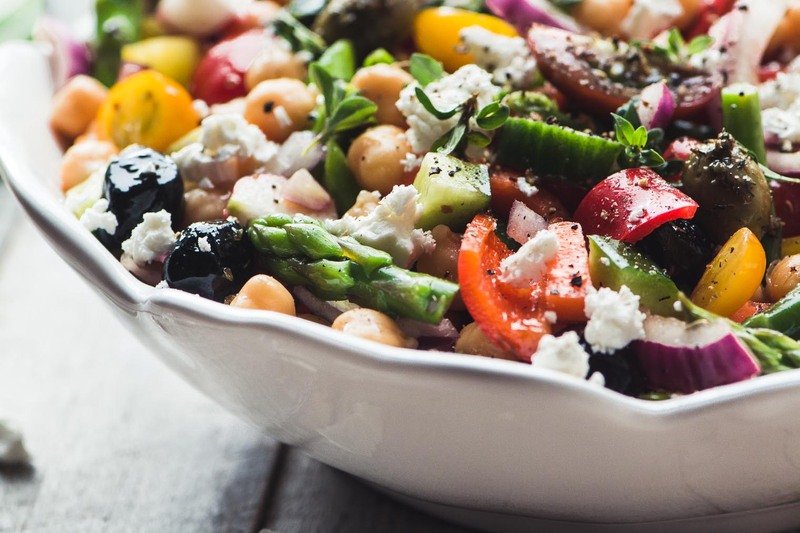 I love the little edge that crumbled feta adds to this salad. 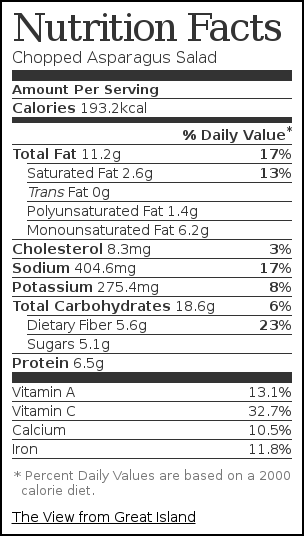 I’ve discovered that imported feta is far FAR better than the regular stuff, and I highly recommend trying it if you see it. I’ve found Greek and Bulgarian, and it’s made with sheep’s milk. The flavor is salty and complex ~ not as sharp as our cow’s milk feta here. 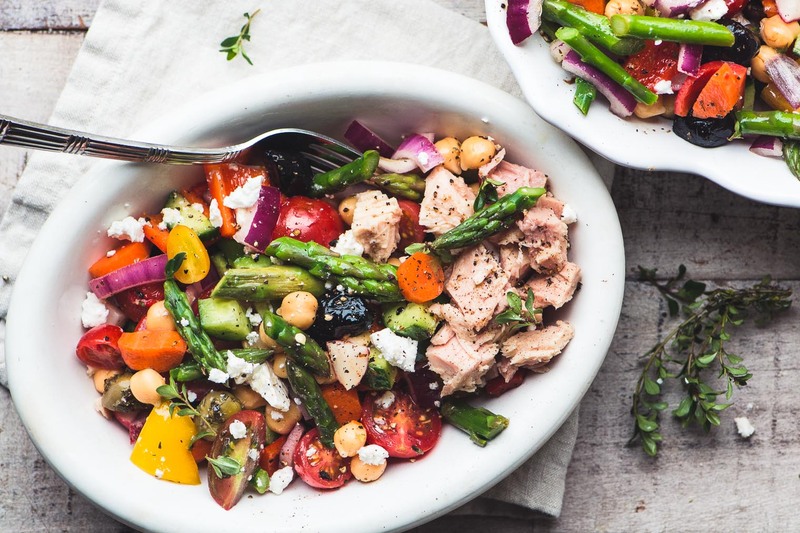 I love to add some great canned tuna to this chopped asparagus salad, which makes it a complete meal. I sometimes add a couple of hard cooked eggs, too. If you’re feeling fancy you could use fresh salmon or shrimp. Make my Chopped Asparagus Salad recipe when the spring asparagus is plentiful and cheap, and you're craving a bit of fresh crunch in your life after a long winter. This salad is naturally gluten free and vegetarian. Leave out the cheese for a vegan salad. Omit the beans for Paleo, the cheese and beans for Whole 30. Any type of canned bean will work, I almost used white beans ~ red kidneys would be great, too. 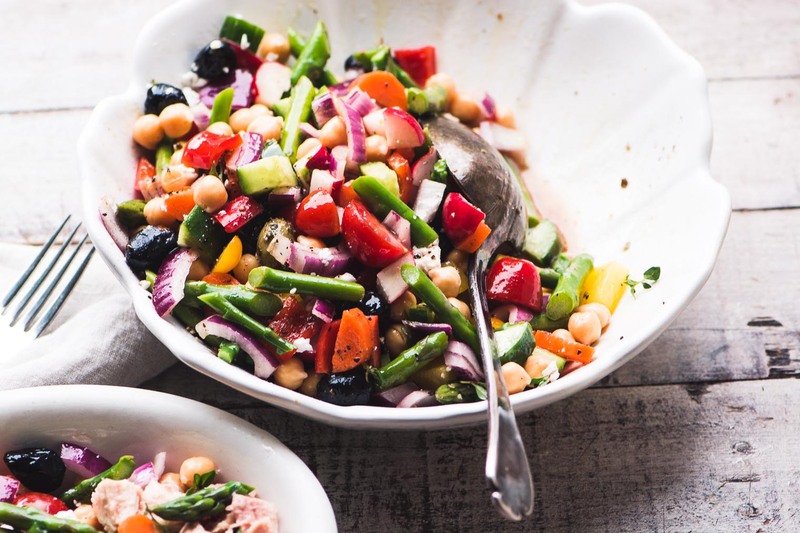 Thanks for pinning this healthy Chopped Asparagus Salad! 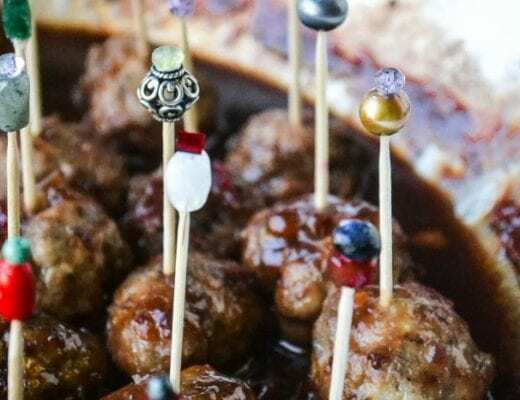 Thanks for the shout-out for my recipe! And this salad sounds amazing. This is so yummy and healthy! Eating it as I write this! Hi Sue, I was looking for a fresh take on salad and came across your asparagus salad recipe. My husband and I loved it! I don’t typically like radishes but I found that their flavor was complimented by the other veggies. I had some leftover shell pasta that I threw in and I got lazy with the dressing so I used an olive oil garlic dressing that happened to be in my fridge. I’ll have to make the actual recipe dressing the next time around. Anyway, I wanted to thank you for sharing this versatile dish. I look forward to trying out your other salad creations! ? Thanks Reeta, I love the idea of turning this into a pasta salad, and I’m due for another pasta salad recipe on the blog before the summer’s out, so you’ve inspired me. Gorgeous recipe. I’m a Garde Manger prep cook, this is right up my alley. Hubby will NOT go for beans. I was thinking of, at the end, adding roasted chickpeas…that might work right? Was in the local supermarket today and they had asparagus on sale for $1.99. Needless to say, I just finished making this salad with a few minor changes to ingredients. I tasted it before it went into the fridge and it’s soooo good. Now the countdown to lunch…… These are the kinds of things I should be eating and can tell you know that it will be on the menu often. Thanks for the recipe. Looks so lovely. We will not have asparagus before May so there is still a long way to go. Right now we actually have no vegetables in true season in Denmark (beside Jerusalem artichokes). That’s so interesting Marina, there is such a huge difference between our climates…here in CA there is never a break from the fresh veggies, I sometimes wish there was! But why? I SO miss fresh spring veg in Marts and have all kind of little tricks to introduce at least some spring felling into my cooking this time of year. I would love to have something in true season. We do have fish in season, but they are not readily available in grocery stores. In Denmark you now have to buy fish online if you want something a little unusual and live outside the big cities. Like lots of other people I buy fish in subscription. They bring me a box of what ever they decide once a week and it comes complet with a suggested recipe and all. You can also buy subscriptions with everything needed for the suggested recipe and that is very popular. However I miss going to the fishmonger. That’s interesting…meal delivery services are big here too, where they deliver the ingredients with the easy recipe all ready to go. Maybe small specialty markets will be disappearing soon, that’s sort of sad. Yum! This is our kind of salad and it’s calling our name!! Lovely photos Sue! So colourful and pretty! 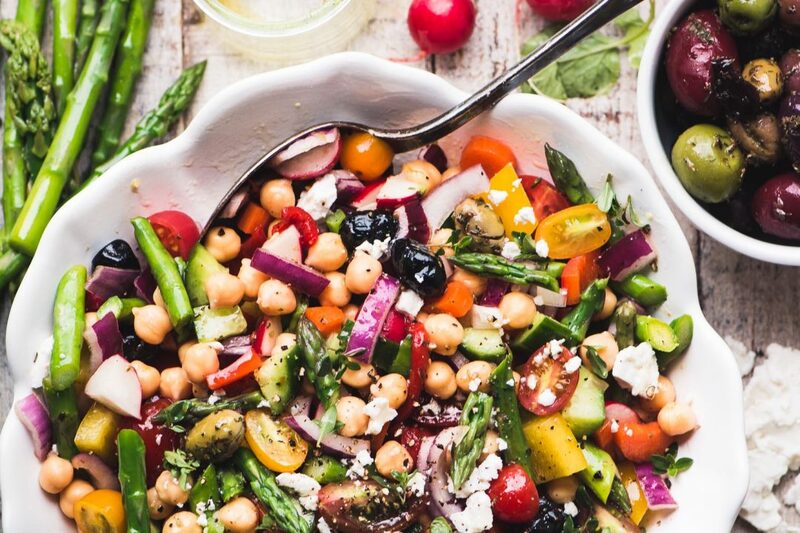 An awesome salad to welcome spring! I once saw a documentary on asparagus and it’s incredibly labor intensive…it’s a wonder it’s ever affordable! This looks fabulous, Sue! A perfect way to herald in the new season!